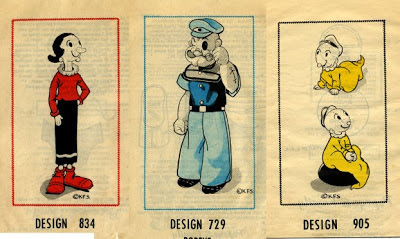 Popeye, Olive Oyl and Swee'Pea patterns were issued in 1979, on the 50th anniversary of Popeye's debut in the comic strip "Thimble Theater" by E.C. Segar. The dolls are 16", 18" and 12" tall respectively. They were advertised in newspapers and magazines. These dolls have some unusual construction details to make them resemble the original comic characters. 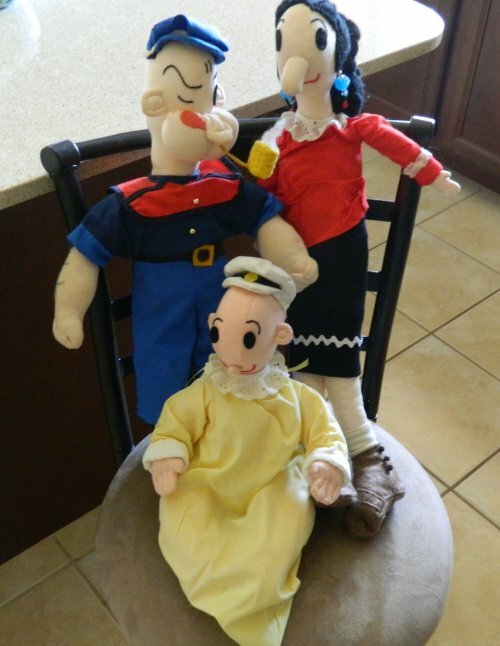 All three have baseball style heads, but Popeye has a large chin piece added on and stuffed separately. 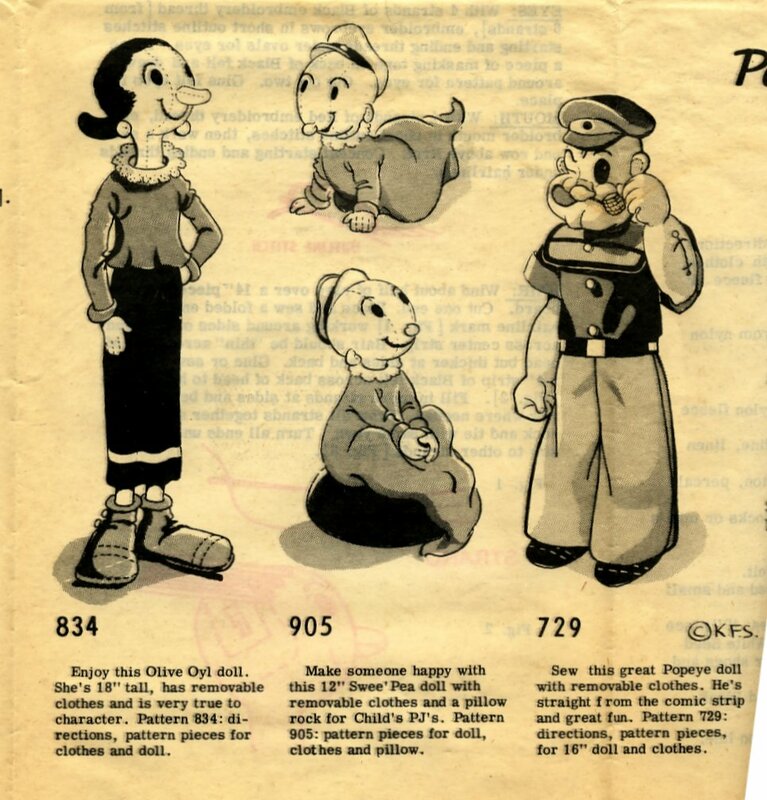 Olive Oyl's torso is a rectangle with long thin neck, arms and legs. Their legs are constructed like pants, joined at the top. Swee'Pea has curved legs under his sacque. All have applied noses and felt eyes. Their other features, including Popeye's tattoos, are embroidered. Olive has yarn hair. 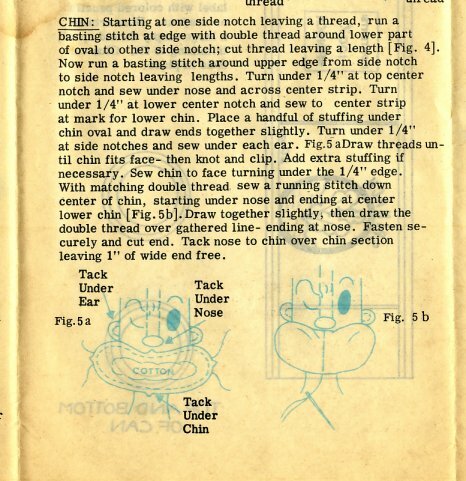 Instructions to make Popeye's pipe and spinach can are included. 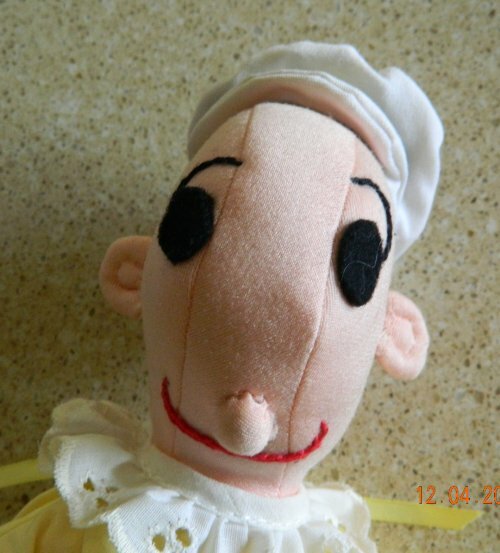 The instructions call for peach-colored nylon fleece or double knit to make the dolls. Popeye's body may be made from woven fabric rather than knit. Their clothes are made to be removable. These patterns seem to be fairly common and are widely available as photocopies, despite being technically still under copyright. The lack of a date on the pattern, or any copyright information, may lead some to think they are older than they are. Dolls that I have seen made up from these patterns are a couple of inches taller than what the patterns indicate. Not sure if the patterns are sized incorrectly, or it's caused by the stretching of the knit fabrics used to make them. Also, the heads seem to come out elongated rather than round. The maker of these dolls did a great job. 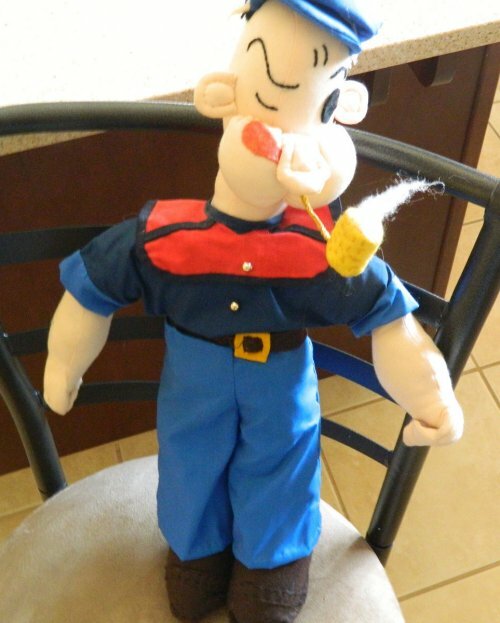 I love the fiberfill "smoke" coming out of Popeye's pipe. Doll photos courtesy of ebay seller peggylbyrne .